There are many landscapes consisting of wonderful specimens of old and valuable trees whose owners – public institutions, parks, old cemeteries, etc. – do not have the financial means to provide the care these trees deserve. 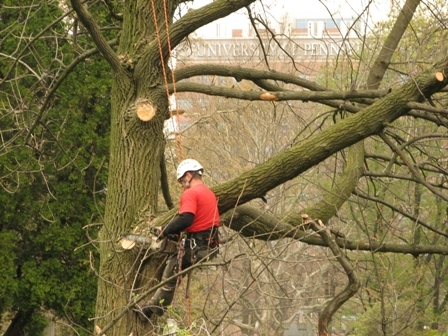 The local chapter of our professional society, The International Society of Arboriculture, tries to do something about that. 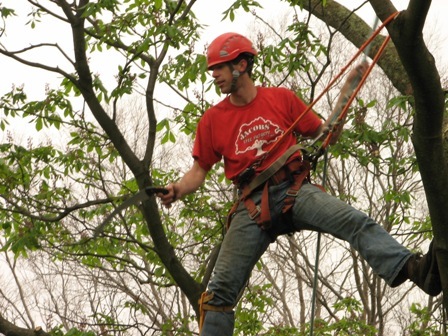 Each year a nice bunch of volunteer arborists from Penn-Del ISA gets together to perform a day of free tree care service for a needy organization. This year the very worthy recipient was the Woodlands Cemetery in Philadelphia. What a magnificent site this is! It’s a National Historic Landmark, and a horticulturally significant 54 acre oasis right in the middle of Philadelphia, near the University of Pennsylvania. Today, “Earth Day” 2009, was the day. Rick, Scott and I had a really fun time working together, in well-organized teamwork, with fellow arborists from around the chapter. Some of use are competitors in business the rest of the year, but that doesn’t keep us from being best of comrades for this labor of love. We met new friends, shared stories (many with similar themes) and got a lot of really high quality pruning work done. What a satisfying day it’s been! I’m tired! Good Night!